We started late. The clouds hung low and threatened rain. I was tired and grumpy after a restless night. The things we’d done and seen the evening before had made me happy, but now I felt like we were on a fifteen-cities-in-fourteen-days tour. Only this time, we were on a roll through of the interior of France, the Burgundy and into the Champagne. I wanted more of French daily life but knew that kind of experience would only come if, someday in the future, I took up my shoulder bag and walked or hitchhiked the routes we traveled. I grumbled through breakfast. I humped around alone, not wanting company. I was short with Virginia and Nick. They asked me what was wrong, and all I did was harrumph. Once we were on the road, I began to feel better. The short drive through Clamecy took us again through heavy forest and then up into a series of rolling hills and into Vezelay. The campervan hummed along the roads and left me without much care about where we were and where we were going. My tourist self slumped in the seat, my mind working through the immense variety of sights and sounds of the previous days. Tourists and pilgrims thronged the narrow streets of Vezelay. We came to a parking lot at the base of the long ridge that the village straddled. Udo wanted to see the 11th century Romanesque Basilica of St. Magdalene, which sat at the top of a mountain. Benedictine monks first inhabited the immense hill in the ninth century and still maintained an abbey at the crest. In the tenth century, crusaders transported the alleged bones of Mary Magdalene to the abbey, and in the eleventh century Pope Stephen IX confirmed the authenticity of the relics. Construction of the massive basilica began in the eleventh century and continued into the thirteenth. The relics’ genuineness came under scrutiny in 1279 when church authorities discovered a shrine to Mary Magdalene in Saint-Maximin-la-Sainte-Baume in Provence that contained her skull. After the revelation, the Vezelay abbey lost support and the basilica began a period of neglect. French Huguenots, followers of John Calvin after the Reformation, sacked the basilica in the late 1500s and the church languished through the 1700s. Rioters in the French Revolution wrought further damage. A restoration began in 1840 under the architect Eugene Viollet-le-Luc and lasted more than twenty years. 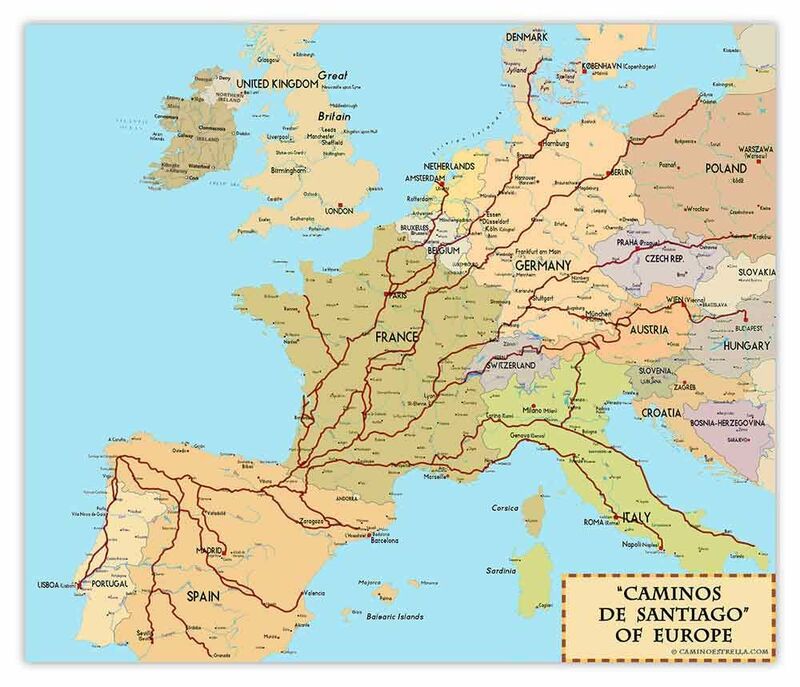 The present structure is one of the starting points for the pilgrimage of the Camino De Santiago. The stained-glass windows of the basilica were famous, and Udo, the artist, took particular interest in seeing the old church. At the time, I had little interest in seeing any of it. I wanted to be by myself. The overcast sky got right into my bones. Traveling at close quarters with others of my ilk also drove me a special kind of crazy. I didn’t want to see them anymore, at least for awhile. I wanted only to lay back in the van, take in the sounds of the people and the market at the base of the hill, and nap. After a little fight about it, I sent them off on their pilgrimage and lay down. Sleep came and went, and after an hour or so, my senses returned. I lit out into the crowds of tourists and pilgrims. I knew that if I didn’t find my travel mates along the narrow street or in the basilica, they would wait for me until I returned. Or I’d return and wait for them. Or, maybe, because of the way I was acting, they wouldn’t wait at all. I wouldn’t blame them. It was a chance I’d have to take. I pushed off up the hill. Houses and shops, filled with tourists, lined both sides of the street. I passed them all, challenging myself to make it up to the basilica at a quick clip. Soon, my heart pulsed in my chest and breaths came quickly. The more I pushed myself, the better I felt. I followed the winding street, sometimes stopping to look at the offerings of the wine shops set in little bays of windows outside. I thought that we ought to bring Josef back a good first cru, something he might keep in his cellar and enjoy with guests. He always appreciated the gift of wine. As I neared the top of the hill, the ridge narrowed and allowed no houses or buildings on one or the other side of the street. Rock and brick walls kept people from plunging down the bluff sides and into the vineyards below. Those vineyards draped the long ridge and fell into the valley, where crews of workers walked behind tractors and trucks that crawled along the lanes cut into the sides of the hill. The Benedictines first planted and produced the famous burgundies made from Chardonnay, Pinot Noir, and Melon de Bourgogne. Modern winemaking was everywhere evident in the width of the rows of vine that would allow vintners to lower automatic sprayers and implements from their tractors. At the steepest inclines, the rows narrowed, indicating that vineyard workers still tended those vines by hand. All through the Burgundy, I was amazed to see vineyards sometimes as steep as those on the Mosel. While the vines rarely rose into heady precipices like those found on the Mosel, the vineyards climbed to such height and steepness that despite all the modern technology used in vineyard production today, only people would be able to reach them on foot. Such steep hillside plantings implied that Burgundies produced from those slopes demanded prices that justified the labor-intensive plantings. Workers carried manual sprayers on their backs up those grades. They would have to drag soil that eroded downward from weather and the feet of the laborers back toward the top. They would also carry up also lighter tools, such as hoes, shovels, and shears. Workers would have to haul grapes out on their backs, heavy work that demanded strength and stamina. I remembered doing the work myself in the Averlertal when I lived in Trier. While I loved the physical labor, I didn’t envy anyone who had to perform such tasks. I paused at one of the walls just as the sky was breaking up. Cloud shadows skipped across vineyards on distant hills and the agricultural fields of corn and hay below. The scene reminded me of a Thomas Hart Benton painting, the clumps of trees and winding roads distinct but beautifully surreal. There was just too much to take in. A slight, warm breeze blew up over the wall, bringing the scents of soil and cut grass. I breathed deeply and took a minute, listening to the crowd chatter by behind me. I was glad to be free of the need to interpret or be interpreted to. It was enough for me to have the moment to myself.